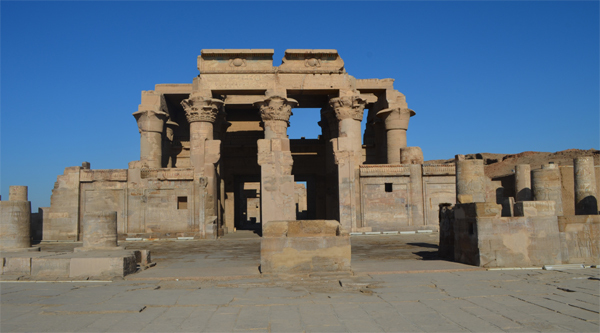 View of Kom Ombo temple. Hypostyle hall at Kom Ombo temple. Medicine tools depicted on the wall of the temple. Excursion to Kom Ombo temple. Wall decoration of the temple. Facade of Kom Ombo temple. Nilometer at Kom Ombo temple. A beautifully engraved picture at Kom Ombo temple. Depiction of offerings at temple of Kom Ombo. The ruins of the town of Ombos is situated on a hill that rises some 18 metres above the surrounding plain Kom Ombo (the ancient Nubyt) means "Hill of Ombos". At this point there is a curve of the Nile with large island in front of it. This island may once have been a heaven for crocodiles that were at first propitiated by the local populace, and then venerated. Kom Ombo was a site of no great prosperity until Ptolemaic times when it became capital of a separated nome (province). The town commanded the trade routes in th e area and it was, therefore, of strategic importance. To please the local population a temple was built. A Double Temple to two hitherto unrelated deities was built: the hawk god Horwer or Horus the Elder and Sobek, the crocodile god. The temple is, in this respect, unique. The Double Temple is built on a traditional plan but there is an invisible division down the middle. Two separate doorways extend its entire length, past the halls and antechambers, ultimately leading to two sanctuaries, one to Horus and the other to Sobek. There is evidence that construction and building continued for some four hundred years, the latest Roman emperor featured being Macrinus (AD 217). 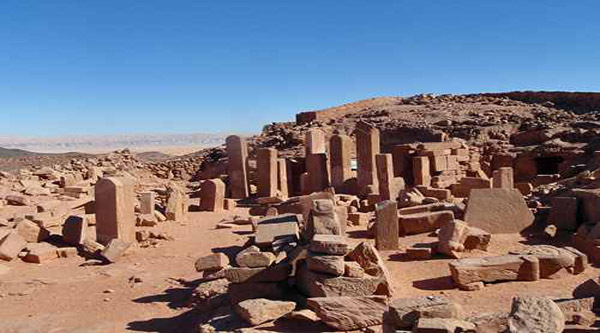 In addition to the main temple there is a Birth House and a Shrine to Hathor, both of which date to Roman period. The entrances face south. The left hand tower, which is mostly destroyed, depicted scenes relating to the triad headed by Horus the Elder with Isis as his wife and Horus, ?son of isis?, as his son. The righ hand tower shows scenes relating to the triad headed by Sobek with Hathor as his wife, and Khonsu as their son. The triads are depicted on the lower parts of the wall. The court is spacious. It has eight columns on each side and an altar near the center. 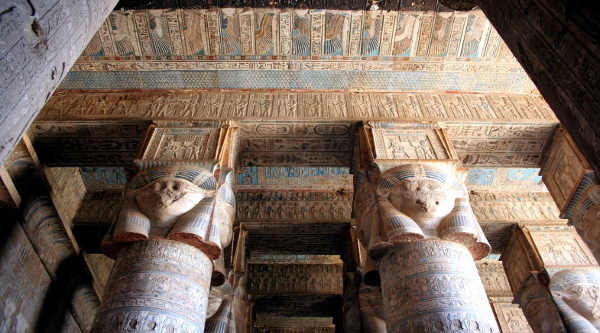 The Great Hypostyle Hall has 10 columns supporting a roof that is decorated with flying vultures along the two main aisles, and astronomical figures beneath the architrave. Attention is drawn to the elegance of the capitals, and their variety of decorative motives. Many show elaborate palm frond and flower capitals. The wall reliefs are well preserved; they show all the Ptolemaic rulers who contributed to the decoration of the temple: Ptolemy VI, Ptolemy IX, Ptolemy XII. The reliefs on the inside of the temple, which date to Ptolemaic times, are finer than the crude sunken reliefs on the outer walls of the temple, which date to Roman times. 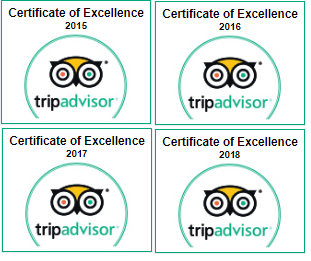 Unfortunately the two sanctuaries are in a poor state of preservation. Horus's granite pedestal stood to the east, and Sobek's to the west. Between the 2 sanctuaries, a hidden corridor has been built into the thickness of the wall. This secret place could only be approached from a chamber situated immediately to the rear, where a portion of the floor could be raised to admit a priest to a passage below ground level. The priest must have played a part in the oracular power attributed to the two deities. 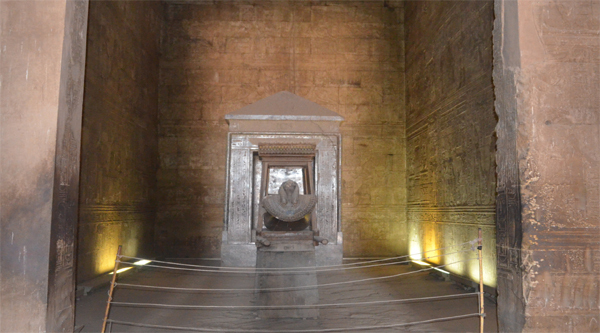 The inner corridor leads to seven chambers to the rear of the temple; the entire corridor is decorated with reliefs some of them are unfinished. The outer corridor is also decorated throughout and can be approached from the court. The scenes here on the left-hand corridor relate to Horus and those to the right to Sobek.